When the need for sun wear arises you want a brand that provides the best protection from the sun’s harmful UV rays. Other factors to consider are the amount of time spent outdoors, the darkness of the lenses, the frame fit and comfort, and the ability to accommodate a prescription. And finally the most crucial element, the fashion statement! Lets address some of these concerns. 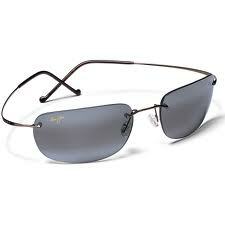 Maui Jim is a leading force in fashionable and protective sun wear, for both prescription and nonprescription lenses. Maui Jim has been at the forefront of the industry in developing lens manufacturing processes that eliminate the issues that can arise from changing between your regular eyewear and sun wear due to the size and wrap of the sunglasses. Maui Jim’s formulation in lens material, blue light blocking measures, polarization, and choice in anti-reflective coating design makes Maui Jim lenses the perfect match for sunglass needs. Maui Jim frames also use the latest technology in design and material, giving a wide array of choices and options for both men and woman. The result is a comfortable, durable, and fashion forward choices in sun wear. Whether you are on the beach, fishing on the lake, skiing the highest mountain, or just want the best sun protection available, or you just want to look good, Maui Jim fits the bill.